In an increasingly global and mobile society, we are faced with greater cultural diversity both in our professional and private lives. As a result of this, more and more emphasis is being placed on the need for intercultural awareness, adaptation and respect for cultural differences. This is reflected in the updated (2013) Higher Education (HE) curriculum for the two-year Business Administration and Management program in France, which now includes an intercultural communicative language teaching strand for Business English (BE) classes. For English language teachers, the real challenge is to find a meaningful and entertaining way to sensitize learners to the complexities of this topic, while assisting them in the development of their professional English and metacognitive skills. This teaching note investigates the implementation and results of pedagogical method which involves a group of first year business students for a professional peer collaborative role-play activity by means of the Content and Language Integrated Learning (CLIL) approach. Dans une société de plus en plus mobile et globalisé, nous sommes confrontés à une plus grande diversité culturelle dans nos vies professionnelles et nos vies privées. Pour cette raison, l'accent est mis de plus en plus sur la nécessité d'une sensibilisation interculturelle et l'adaptation, ainsi que le respect des différences culturelles. Cela se reflète dans le programme de l’Enseignement supérieur en France qui a été mis à jour en 2013 pour le programme d'administration et de gestion des entreprises de deux ans, qui intègre désormais la communication interculturelle au cours d'anglais des affaires. Pour les enseignants, le véritable défi est de trouver une manière significative et ludique pour sensibiliser les apprenants à la complexité de ce sujet, tout en les aidant dans le développement de leurs compétences linguistiques et métacognitives en anglais professionnel. Cet article examine la mise en œuvre et les résultats d’une méthode pédagogique qui implique un groupe d'étudiants de première année en cours d’anglais des affaires lors d’un jeu de rôle dans le contexte d'une approche de l'apprentissage des langues intégré (Emile). 1In recent years, the relationship between language and culture in the L2 classroom has been a topic of contention and debate for different critics from Byram (87-104) to Kramsch (34-101) and Liddicoat (4-11). These researchers believe that language and cultural learning in the language classroom must go far beyond the mere acquisition of facts and information about a foreign country. As a result of their rich socio-cultural backgrounds and previous educational experiences, Dogancay-Aktuna (105) explains that both language teachers and learners bring to the classroom certain norms and expectations concerning appropriate teacher and learner roles and the teaching-learning practices they believe to be conducive to overall language learning in the classroom. In order to prevent frustration and failure due to a disparity between the teachers’ and learners’ expectations, Dogancay-Aktuna (100) insists that teachers (and in particular teacher trainees) need to consider to what extent the underlying principles of their chosen methodology will correspond with the set of assumptions that student learners bring to the classroom. 2While designing courses in the context of English for Specific Purposes (ESP), Fink (6-15) suggests that language teachers must consider an extensive variety of situational factors as well as constraints related to time, for instance. To illustrate this point, teachers can, for example, opt for professional presentations to evaluate students’ oral communication skills. For Fink (42) this type of activity assists students in actively engaging in effective practical thinking which will have extensive value in their personal, social, and work life. It has been shown that oral presentations are an effective and relevant way for students to simulate and improve their specialized workplace vocabulary and skills (Di Pardo Léon-Henri “Breaking the Ice” 352). However, individual presentations may sometimes prove to be rather time consuming when considering the fact that often, teachers are faced with the challenge of managing a large number of students per classroom. Peer-collaborative tasks which integrate language (communication), culture and content as well as significant and relevant learning (cognition) have proven to be a practical solution to this particular problem, as Di Pardo Léon-Henri (“CLIL” 15) has shown. In this way, students are offered a forum (both inside and outside of scheduled class time) to innovate and conceptualize from different perspectives while actively brainstorming and problem solving as a functioning group. This forum corresponds to the Content and Language Integrated Learning (CLIL) setting which is composed of the 4 C’s: communication, culture, content and cognition (Coyle et al. 53-55). 3Since role-play or simulation encourages reflective thinking and creativity (Di Pardo Léon-Henri “Breaking the Ice” 352) students can develop and practice new language and behavioural skills in a relatively nonthreatening setting. According to Jones (4-17), this environment can increase motivation and participation which are necessary for learning to occur. In a similar fashion, Dorathy and Mahalakshmi (3) express that language teaching is not just about teaching languages and culture; it is also about helping students to develop their own personality. In addition, Di-Pardo Léon-Henri (“CLIL” 14-16) shows that, when participating in role-play activities, higher education (HE) students are then offered the opportunity to benefit from the development of their professional skills and identity. Furthermore the development of metacognitive skills is an intrinsic and integral part of the peer-collaborative role-play experience. By means of this innovative and pragmatic approach to language learning and communication, the language teacher breaks with the traditional classroom practises and subsequently empowers the students by encouraging them to actively participate in probing and decision-making. Additionally, if the pedagogical activity is engineered or designed in such a manner, the students can be persuaded to autonomously assume a degree of responsibility. By actively participating in first choosing their topic, the students can then proceed to conceptualize an original idea and construct their dialogue by including key vocabulary terms or expressions while preparing their personalized role-play scenarios. 5The framework above can assist teachers in achieving pedagogical learning objectives. Each approach corresponds to certain roles and responsibilities associated with differing teacher and student relationships or teaching and learning contracts. There are many advantages associated with lesson planning which liberates students and teachers from the more traditional classroom roles and settings. In general, the addition of creative activities such as role-play which require the active participation of students is a refreshing change for students (and teachers) who welcome the break from the traditional lecture and common teaching techniques. In addition, both students and teachers can benefit from alternating among the afore-mentioned approaches to communication. This type of reciprocal communication in turn supports what Engle and Conant (399-483) designate as a “productive disciplinary engagement” (for an illustration of this concept, refer to Engle and Conant 430) in the classroom. It should be noted that the productivity component does not systematically have to stem from the teaching side of the equation. Students can also thrive in a setting where they are granted the tools, tasks, authorization and freedom to innovate, create and produce. This progressively modern attitude towards language teaching is not only rewarding and interesting for the students, but also refreshingly surprising for teachers, since often times the students engage fully in the activity while showing innovative and ingenious qualities. 6Within the CLIL setting of a Business English context, the principal objective of this study is to understand the implications and outcomes associated with the use of a peer collaborative role-play task in L2 language learning. The research is based on quantitative and qualitative results for this study in which a questionnaire is used to collect students’ responses and feedback. The test group is composed of 85 first year students who are pursuing their diploma in Commercial Management at the Institute of Technology (IUT) of Belfort-Montbéliard in the University of Franche-Comté. 7To foster increased understanding and knowledge of globalised professional settings and, in particular, intercultural business relations, it is increasingly important for language instructors to dedicate part of their language teaching to intercultural awareness. For this reason, the first semester students are taught to explore and learn practical terms and expressions (vocabulary and content) as well as various aspects of cross-cultural communication (verbal and non-verbal) in professional settings. In this way, the students can develop their metacognitive skills while brainstorming, analysing issues and problem solving. Additionally, the students are offered the opportunity to improve their communication skills (speaking, pronunciation, interactivity…) to better prepare for their role-play activity in their groups. 8In this pedagogical method, the chosen role-play activity is divided into three stages: preparation, presentation and feedback. A minimum of 3 classes or four to five class hours is required for this activity. The teacher will require tools such as a video projector and computer with a power-point presentation to describe general information to the students (for examples or illustrations, suitable vocabulary and practical expressions about intercultural communication – see Appendix A). A period of discussion and debate will then ensue. 9Next, the teacher will present the activity and provide the students with the guidelines and details of the role-play (see Appendix B). This activity sheet can be handed out to the class, sent via email or posted to an online platform. 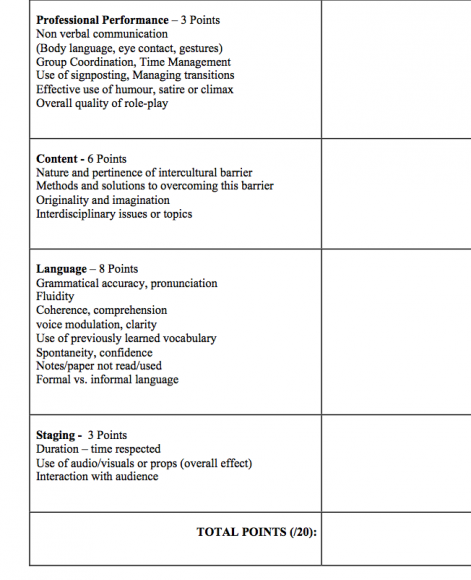 To evaluate the students during the presentation of the role-play, the teacher will require the evaluation grid (refer to Appendix C). And finally, after the last role-play presentation, the teacher will distribute the questionnaire (refer to Appendix D). Ideally, the questionnaire should be distributed immediately at the end of the last role-play to avoid the students overlooking important details and the risks associated with memory lapse if, for instance, they are obliged to wait until the next class. 10During the first class dedicated to this pedagogical approach, a dialogical teaching method is used to introduce the topic of interculturality in the classroom. Some examples are given to the students to focus their interest on the topic at hand. In your opinion, how would you react in the following professional settings? - You invite a colleague to lunch and you learn that she/he only eats halal foods. - You call a foreign client and you don’t understand her/his dialect or accent. - Your new foreign colleague has a habit of dressing very casually and they often arrive quite late for meetings and appointments. This behaviour is drawing the attention of colleagues and it is quickly becoming a problem. - You are transferred to another office in a foreign country and you are worried about certain stereotypes [you have heard about food and traditions] and a negative image of that culture or that country. 12The situations above encourage the students to imagine how they would react in very different circumstances. In addition, this activity orients the students’ focus toward the importance of thinking about, preparing for and developing intercultural communication skills in different professional settings. 13The students may then be asked about their knowledge on the topic when the teacher initiates a dialogue by asking probing questions such as: What is interculturality? and Why is it so important in today’s professional setting? These questions stimulate an open dialogue and a debate ensues. The objective here is to assist the students in formulating a clear working definition of interculturality with specific examples and illustrations. - ethnic (as well as moral differences). 15Since cultural stereotypes can hinder or damage intercultural communication and relations, the teacher should address how they can sometimes lead to generalisations and narrow-mindedness. This is followed by discussions on various professional situations such as how different cultures manage meetings, conferences or telephone calls and how to deal with visiting foreign companies. Effective intercultural communication practices are then briefly brainstormed and discussed with the students. 16Lastly, the students are given a list of expressions and vocabulary (refer to Appendix A) to review for the next class. These expressions and words can be useful in overcoming barriers associated with intercultural communication in a professional setting. 17To undertake the role-play activity, the presentation of Gibbons’ framework is somewhat modified and then implemented. 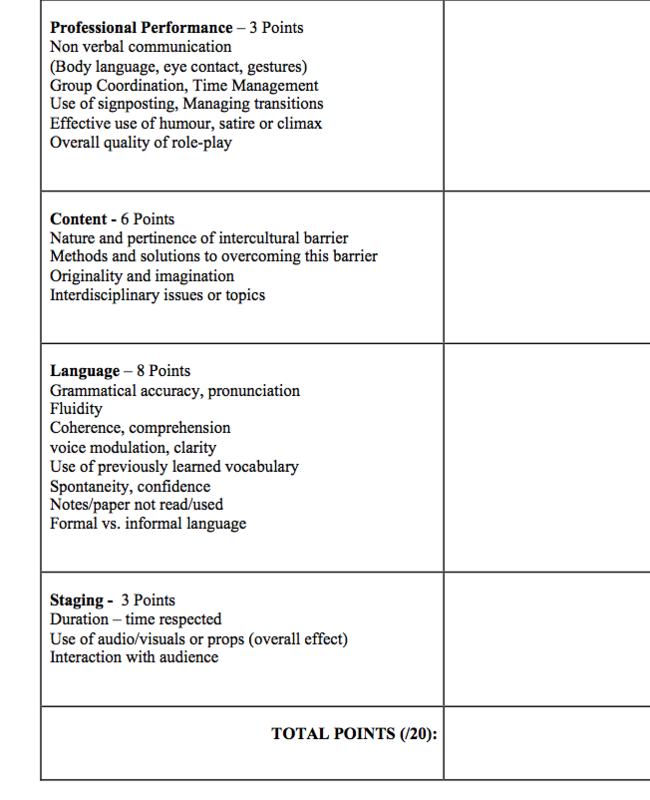 An advocate for the scaffolding of learning and teaching activities, Gibbons (198-200) proposes five different stages that are associated with oral or written tasks in the CLIL classroom. In addition and to enhance the overall effectiveness of student learning, the Mortimer and Scott (397-398) communicative approach has been incorporated at every stage of the role-play activity. - and reflection on the task. 20The data is subsequently organised under different headings based on the questions from the questionnaire, and the statistics are then generated and analysed. A spreadsheet software program is utilized to analyse the survey results. The data analysis in the next section addresses language and content learning outcomes of this activity in the CLIL setting. It also focuses on micro-analysis of the collected data to understand the learning outcomes of the role-play activity so as to ultimately improve teaching pedagogy and learning outcomes. How satisfied were you with the role-play activity? Table 1: Motivation and Engagement. 22More than 75% of the students are highly and very satisfied with the role-play and they agree that it encourages them to both learn and practice language skills. These results demonstrate that the role-play activity can be a useful tool in the CLIL classroom. However, the qualitative data suggests that performing this activity within a short time is somewhat challenging for the students. If possible, the students would prefer to have more class time to prepare for it. This is a very common request from students who are obliged to manage a full schedule of classes and projects. Nevertheless, this would defeat one of the underlying objectives of this task: to encourage the students to be more independent, autonomous and engaged in their language learning outside of class time. 23Another important objective of this pedagogy is to focus on various aspects of language learning. To this effect, a question in the form of a statement reveals the following in Table 2 (below). 24The vast majority of the students concur that they progressed in developing their writing skills while preparing for a task involving dialogue. A similar number of students agree that their listening comprehension, speaking and grammar skills also progressed. However, an analysis of the results shows that with regard to vocabulary development they did not fare as well as in the other areas. The study of the results of this test group shows a 10% difference in terms of writing skills progress as compared to vocabulary learning. The results suggest that the students in this study focussed slightly less on vocabulary and more on speaking and writing skills. It is quite possible that the activity was not as effective for learning vocabulary or simply that the students did not see it as a vocabulary learning activity. 25In the context of CLIL, the combined dual aim of content and language learning creates a unique teaching and learning setting (Marsh, et al. 11-18). For this reason, it is important to perceive and promote the role-play activity as an opportunity to bring both of these goals together. When the students are asked about the content learning component, the results are both very interesting and revealing. These results are presented in Table 3 (below). 26More than two thirds of the students indicated that they learned about cultural differences, which is very similar to the number of students who responded that they have learnt more about intercultural barriers and communication. A vast majority also agreed that they learned more about other cultures by projecting and imagining various kinds of intercultural and professional situations they might one day encounter. 27Dalton-Puffer (128) observes that role-play has the potential to provide for more natural and genuine communication as the students come into contact with the language as it is used in everyday and professional life. The classroom, therefore, becomes a kind of forum for interaction in the real world, in particular in the case of this study since the L2 is not naturally used outside the classroom. The results clearly show that the students do develop their intercultural awareness; however, there is a striking contrast when it comes to learning more about their own culture (only 45%). Fewer students are able to relate the intercultural aspects of their own culture and surroundings outside the classroom to their classroom learning. Therefore, it would be useful to make this question clearer in order to measure the influence of content instruction on content learning through the medium of L2 language learning. 28With respect to the question of group or peer-collaborative work, a very large number of students express a positive response. More than 80% of the students agree that working in a peer co-operative environment is an effective way to learn English and that it is a source of motivation and satisfaction. The graph in Figure 1 (below) provides the results of the peer collaborative work analysis. Figure 1: Analysis of Results - Peer Collaborative Work. 29It is important to note that almost 40% of the students in this test group prefer to work alone. The reason for this reluctance to work within a group could be related to many different factors, such as: initial apprehensiveness and shyness or a real need to dominate the situation and keep the upper hand on all decision-making. In any case, this question should also be developed to further probe the logic behind this response. 30Figure 1 above demonstrates that most of the students are eager to collaborate in small groups and they prefer to seize the opportunity to perform learning tasks, share ideas, develop a common understanding and build on each other’s ideas together in the L2. In this way, role-play in the form of peer-collaborative work proves to be a beneficial and appealing activity for language development in the CLIL classroom. Moreover, since 86% of the students agree that they learn about many different issues and solutions related to intercultural barriers, we can conclude that this role-play activity not only enhances their classroom learning and professional interactional competency level, but also their basic knowledge of intercultural barriers in everyday communication. 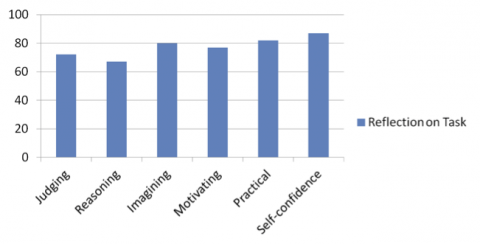 31With regard to carrying out the task and the preparatory stages leading up to the performance of the role-play, the study has revealed some positive results (see Figure 2 below). Figure 2: Analysis of Results - Carrying out the Task. 32The initial preparatory phase involves various stages such as brainstorming and conducting online research, and is characterized by the teacher’s role as that of a moderator. More than two thirds of the students agree that they enjoy working on this activity and that it helps them to become more analytical, imaginative and autonomous in terms of their learning strategies. For L2 development, it is necessary to expose the students to a challenging situation so that they can broaden their language and communication skills. As Ortega (63) states, “optimal L2 learning must include opportunities for language use that is slightly beyond what the learner currently can handle in speaking”. The initial stages provide the students with such an opportunity. A large majority of the students concur that creating a scenario with their group is very challenging for them. 33Given that the students have easy access to English through Internet research, CDs, etc., and that they also have knowledge of web surfing, the students are invited to take advantage of information technology (IT) and resources to discover more about intercultural situations. However, the study reveals that most students chose not to use these resources. In addition, only 35% of the students rehearsed their scenario more than three times before the final oral presentation. This unique opportunity for preparation plays an important role in language development and builds a solid foundation for their role-play activity, particularly when the students are in an autonomous working environment. Nevertheless, the reason for less rehearsal time on the part of the students involved in this study may be due to the timing: early on in the first semester when the students are just discovering and settling into a new, different and challenging academic routine. Figure 3: Analysis of Results - Metacognitive Skills Development. 35Nearly 80% of the students agreed that this activity helped them to develop their imagination. 72% of the students agreed that it helped them develop their judging skills. The students were able to build a bridge between their understanding of intercultural communication and their academic formulation of the topic (as argued by Gibbons). 36Yet in Figure 3 (above), we also notice that only 67% of the students express that this activity assisted in the development of their spontaneous reasoning skills. This is the lowest of all the results. The reason for this could be related to the fact that this assignment demands an enormous cognitive investment and effort on behalf of the students, in terms of both content and language. Perhaps the teacher may implement a scaffolding approach to assist the students with the production of longer dialogue, with more complex vocabulary, more focus on formal and professional English articulation and the sharing of ideas within the shelter of small groups and security of the classroom environment. The interactive/dialogic communicative approach may prove to be useful in this case. 37Since the students’ presentations are the result of the various stages of preparation leading up to the final task, they are encouraged to develop their academic knowledge on the topic as well as their everyday English language communication skills while progressing from one stage to the next. On the one hand, some groups make use of the limited language resources and content that are made available in the classroom. On the other hand, some other groups strive to broaden their English language knowledge and proficiency by incorporating professional issues related to and topics adopted from disciplines such as economics, commerce and law. It is very important that this extra effort should be reflected in the content section of the evaluation grid and rewarded in the form of bonus points. 38In terms of meta-cognitive skills development, the students fully adopt and support the idea that role-plays can be a practical means of learning more about intercultural communication. These results are presented in Table 4 (below). Table 4: Role-Play or Simulation: A Practical Method. 39A large majority (82%) of students agree that this activity and the observation of the other students’ role-plays was very practical in terms of language acquisition and content learning. Similarly, 87% of students found this activity helped them in confidence building since they were required to face the challenge associated with public speaking. Moreover, the questionnaire results show that the majority of students also indicated that, ‘learning by doing’ is the best method for language learning. 40The qualitative and quantitative results illustrate that this role-play activity is a useful and practical way to learn, practice and develop language learning, metacognitive skills and more. In this way, this pedagogical approach respects the CLIL analytical framework and assists learners in acquiring and developing “language of learning” (language used to express key aspects of the content); “language for learning” (language needed to participate in tasks), and “language through learning” (when students are being encouraged to reflect on and express meaning related to content). These forms of learning are the foundations of the Language Triptych, as explained by Coyle et al. (36-38). At the same time, this is only true to a limited extent because some students lack the linguistic knowledge and perhaps the complex grammatical foundations or vocabulary resources in the L2. 41It is worth mentioning that the focus of the CLIL approach is to foster fluency and improve communication skills rather than concentrate on grammatical accuracy as stated in Coyle (10-11). The self-confidence factor is extremely important for the risk-taking and success of students, who can suffer from an inferiority complex and a feeling of desolation if they are confronted with a multitude of their own grammatical errors. The negative implications can be detrimental to their motivation level. Language students can thrive in the classroom where the teacher chooses to simply remove the pressure of being grammatically perfect. There is a time and place for grammar, and, as this study shows, by integrating dynamic activities which focus on communication skills, the students can build their self-confidence level in a positive way. Therefore, lesson planning requires the scaffolding of active involvement on the part of the teacher, as well as the learners and their peers, to accomplish the CLIL language and content learning objectives. 42Since each group was given the freedom to create its own scenario, the group members created and presented very differing and sometimes entertaining intercultural situations with many issues and creative ideas for solutions. A few groups made use of humour while others chose to function in a more serious vein. In this section, the presentations of two groups are examined to clearly illustrate the end result of this pedagogical approach. 43For instance, one group of students decided to demonstrate Eastern/Western cultural barriers in a professional setting. To give the role-play some verisimilitude, this group of students chose to portray two different company cultures with a few employees from an Asian firm and a few employees from a French company. Students with Asian and Arabic origins constituted the Asian firm while the other students represented the French company. The intercultural barrier they chose to highlight was the total chaos which can ensue when cultural differences impede upon communication during an important first encounter meeting (issues related to punctuality, greeting colleagues, starting a meeting, addressing colleagues by their first names, inappropriately joking around, managing a meeting and more specifically maintaining and redirecting the colleagues’ attention during the meeting…). These cultural differences became the source of frustration for certain colleagues, who felt they were wasting their time, and the resulting communication barriers developed into a real dilemma during the meeting. However, a few of the employees from both companies used the appropriate communication forms (vocabulary and expressions in Appendix A) to cunningly save the situation while adapting to and working out the different issues at stake. 44In a second example, another group of students focused on a negotiation scenario in a foreign country. The various cultural barriers they presented led to different professional issues and confrontations. During this role-play, they used several props and costumes, as well as projected slides to create a foreign ambience in the classroom. At the Semester 1 entry level, these students had not yet studied negotiation techniques in the language class; however, they had learnt about some of the techniques in their other courses. This particular role-play was quite interesting since the students chose to bring “new information” to the classroom and share a scenario that would help their fellow classmates to reflect on the situation and further develop their communication skills in this area. The audience appeared to appreciate this initiative. This group’s openness to explore a new culture and experiment with new vocabulary was a welcome surprise. They later explained that sharing their desire to travel the world was the starting point in their ambition to pursue an international career. They were able to illustrate their own weaknesses and strengths as international marketing professionals, while learning more about their career choice. As illustrated in this example, the role-play activity clearly cultivates a setting for creativity, innovation, self-projection and professional identity development with language learning. 45The results of this action research study have shown that a role-play or simulation activity combined with peer collaboration and an intercultural dimension can prove to be an effective approach to language learning in the CLIL setting. The vast majority of the students are of the opinion that the activity provides them with an opportunity to learn and develop their language skills in a creative setting. Even if the language teacher occasionally adopts the role of facilitator or moderator, the students at this level are active learners who are prepared and willing to assume the responsibilities associated with innovation and decision-making. In addition, they indicate that this method, which breaks with the traditional classroom environments, aims at providing them with a motivating as well as interesting forum which blends communication, culture, content and cognition to learn professional and practical learning outcomes. While actively engaging in the activity, they acknowledged that intercultural communication could be a very challenging issue in the professional setting. This learning-by-doing activity provided the students with the freedom to actively imagine, create, and then analyse priorities and to negotiate their outcomes. Although they did convey the need for more preparation time, which is a very common request from students at the HE level, the students expressed that this activity is not only a valuable way to teach intercultural communication but also a very pragmatic means of encouraging them in the development of their meta-cognitive skills. Byram, Michael. “Teaching and Assessing Intercultural Communicative Competence.” Multilingual Matters: Clevedon, 1997, pp. 87-104. Coyle, Do. “Content and Language Integrated Learning: Motivating Learners and Teachers.” Scottish Languages Review, vol. 13, 2006, pp. 1-18. Coyle, Do, et al. CLIL: Content and Language Integrated Learning. Cambridge University Press, 2010. Dalton-Puffer, Christiane. Discourse in Context and Language Integrated Learning (CLIL) Classrooms. Amsterdam: John Benjamins, 2007. Di Pardo Léon-Henri, Dana. “Breaking the Ice with Business English”. The Journal of Teaching English for Specific and Academic Purposes, vol. 2, n°3, Special Issue, 2014, pp. 345-358. Di Pardo Léon-Henri, Dana. “CLIL in the Business English Classroom: From Language Learning to the Development of Professional Communication and Metacognitive Skills”. ELTWorldOnline, Special Issue, 2015, pp. 1-26. Dogancay-Aktuna, Seran. “Intercultural communication in English language teacher education”. ELT Journal, vol. 59, no 2, 2005, pp. 99-107. Dorathy, Anne, and S. N. Mahalakshmi. 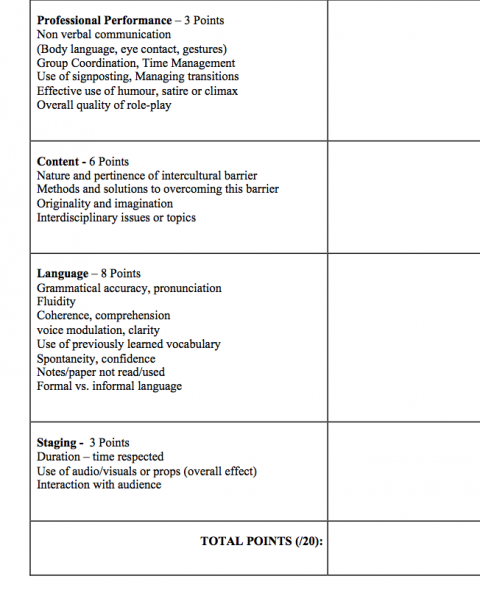 “Second Language Acquisition through Task-based Approach – Role-play in English Language Teaching”. English for Specific Purposes World, vol. 33, no 11, 2011, pp. 1-7. Engle, Randi A., and Faith C., Conant. “Guiding principles for Fostering Productive Disciplinary Engagement: Explaining an Emergent Argument in a Community of Learners’ Classroom.” Cognition and Instruction, vol. 20, no 4, 2002, pp. 399-483. Fink, L. Dee. Creating Significant Learning Experiences: An Integrated Approach to Designing College Courses. Jossey-Bass, 2003. Gibbons, Pauline. Bridging Discourses in the ESL Classroom: Students, Teachers and Researchers. Continuum, 2006. Jones, Ken. Simulations in Language Teaching. Cambridge University. Press, 1982. Kramsch, Claire. Context and Culture in Language Education. Oxford University Press, 1993. Liddicoat, Anthony J. “Static and dynamic views of culture and intercultural language acquisition”. Babel, vol. 36, no 3, 2002, pp. 4-11. Marsh, David. Content and integrated language learning (CLIL): A development trajectory. Servicio de Publicaciones de la Universidad de Córdoba, 2012. Marsh, David, et al. The European framework for CLIL teacher education. Graz: European Centre for Modern Languages, Council of Europe, 2010. Mortimer, Eduardo, and Philip Scott. Meaning Making in Secondary Science Classrooms. Open University Press, 2003. Ortega, Lourdes. Understanding Second Language Acquisition. Hodder Education, 2009. - There is a misunderstanding about…. - It is strange to see…. - This behaviour is offensive …. This role-play activity is on the topic of interculturality and various communication barriers relating to cultural differences, stereotypes, gender differences… Each group will create a unique scenario which involves intercultural communication barriers in a professional setting (between employees, clients and/or customers, suppliers, administration…). During the role-play, the audience (your teacher and classmates) will be witness to the intercultural barriers within your group as well as the negotiations and group effort to find solutions to these issues. 3. You should integrate a dimension of climax (suspense, humour, satire…) by first illustrating a failing or problematic situation and then finally finish with a very successful solution to the intercultural communication barrier(s). 5. The use of props (costumes, communication equipment, food or drink, etc.) and audio-visual equipment is encouraged. However, it is your responsibility to furnish these items. 6. There will be no use of notes or paper during the role-play presentation; otherwise, you will be penalized. The aim of this questionnaire (adapted from Di Pardo Léon-Henri) is to better understand your satisfaction with the role-play activity. Your responses and feedback will be used to improve the activity. It will take you 5 minutes to fill out this questionnaire. Thank you for your participation! 1. The role-play activity provided me with an opportunity to learn and practice more English. 4. The role-plays presented different problems and many solutions to intercultural barriers. 1= a substantial amount ; 2=many ; 3=indifferent ; 4=very few ; 5= nothing new. 5. How would you rate these tasks during the activity? 9. This activity helped me to become more analytical, imaginative and autonomous in language learning. 10. Working in groups (peer cooperative work) is a very effective way to learn language. 11. I enjoyed working on this role-play activity with my group. 14. This activity was helpful in developing my metacognitive (learning to learn) and problem- solving skills. 18. How satisfied were you with the role-play activity? 19. The instructions for this role-play were clearly explained from the start. 21. In your opinion, is ‘learning by doing’ the best method for language learning? 22. Your feedback: provide your opinions below. How can we improve this role-play activity? 23. Can you suggest other activities that can be used in this course along with role-play? Dana Di Pardo Léon-Henri est maître de conférences en anglais à l’université de Franche-Comté où elle enseigne l’anglais (Lansad). Ses recherches portent sur la didactique des langues et l’évaluation diagnostique des compétences linguistiques. Elle fait partie de l’équipe de recherche ELLIADD (EA 4661 - Contextes Langages Didactiques). Bhawana Jain est attachée temporaire d'enseignement et de recherche (ATER) à l’université de Paris 1 –Panthéon Sorbonne.